These six little folk art motifs are sure to put a smile on your face. They are a great size for decorating the top of a canning jar filled with the fruits of your garden. A tiny 2” wooden embroidery hoop would be a cute finish for an ornament. The choices are endless. 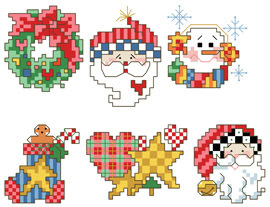 Each Cross Stitch PDF download chart comes with a full color image, chart, DMC floss color guide, general instructions & stitch guide. Contents: Ornaments are 27 stitches high by 27 stitches wide. If stitched on 14 count fabric they would measure almost 2".